miniDSP 2x8 (kit) or 4x10 Hd (boxed) for analog inputs and outputs. If building from the kit, add a DIGI-FP for two digital input/output channels and a VOL-FP for volume and remote control. 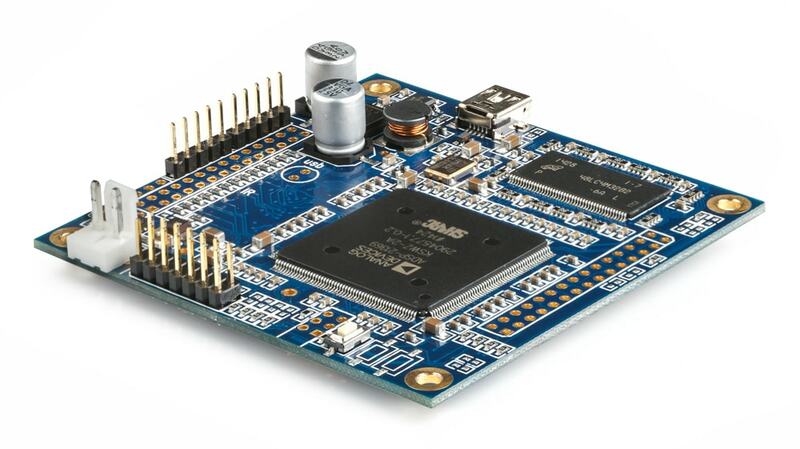 nanoDIGI 2x8 K (kit) or nanoDIGI 2x8 B (boxed) for an all-digital input/output solution. miniSHARC kit for an advanced solution with FIR and IIR filtering, in which you implement your analog or digital I/O via I2S. DDRC-88A + BM option for a room correction + crossover solution. Check out this app note for more details. All of the above options can also be used to generate a subwoofer output signal summed from the left and right input signals, for a two-way-plus-sub or 3-way-plus-sub configuration. The specifics of your hardware configuration depend on the nature of your project, the amplification that you have, and the miniDSP option that you chose above. Here is an example of a 3-way-plus-sub configuration. The example shows a 6-channel amplifier for simplicity, but you can also use three stereo amplifiers, one for each pair of drivers (tweeter, midrange, woofer). Changing to a 3-way or a 4-way speaker simply means leaving off the sub and/or adding another pair of drivers and amplifier channels. The plugins for the above options are all similar. Here we will use the nanoDIGI 2x8 plugin as an example. The interface has three tabs labelled Input, Output, and Routing. Once you have built the loudspeaker, you will need to measure each driver individually and use the PEQ block of its output channel to correct its response. Please refer to step 3 of the app note Building a 2way crossover for information on how to do this, as the procedure is the same except that instead of two drivers, you have three or four! Note: Before doing any measurements, check that all PEQs and Xover filters are disabled. The subwoofer is not measured at this stage. In the Xover block of each output channel, set the crossover filters to the desired crossover point and slope. You can then measure the drivers in pairs (e.g. mid+tweet, woofer+mid) to check that the crossover has integrated the drivers correctly. See section 4 of Building a 2way crossover for further information. Then, measure the completed speaker. For a 3-way or 4-way speaker, a microphone distance greater than the normal 1 meter may be needed for accuracy, so the measurement may need to be done outdoors. If the channel linking has been done as described above, then the crossover and EQ settings for both channels are already in sync. Save the configuration before proceeding. You can now set the speakers up properly in their intended location in the room, and move the microphone to the listening position. Measurements made from now on are "in room" measurements. If using a subwoofer, measure, equalize, and integrate the subwoofer as described in Subwoofer integration with miniDSP. Once everything is set up to measure well, the parametric EQ blocks on the input channels can be used to fine-tune the final in-room response. You can use this to tame additional resonances in the bass region, for example, or to provide a small amount of shelving boost in the bass "to taste." 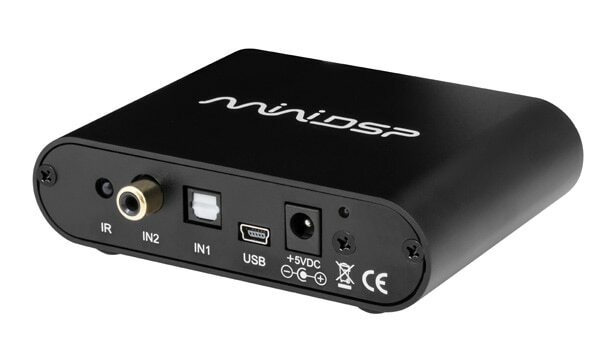 miniDSP 8x8 (kit) or 10x10 Hd (boxed) for multi-channel processing with up to eight analog inputs and outputs. Outputs can be used for active crossover in any manner desired - for example, build a three-way left and right active speaker and a two-way center channel, and use the digital outputs for subs/bass management.